Members of the projects group undertook a preliminary dig at 16 Cross Street over two days 19th and 20th June 2015. The dwelling on this site is one of the oldest in this part of the village and has to our knowledge been in continuous occupation. The current owners have recently demolished a garage and plan to replace it with a new one, therefore it seemed an ideal opportunity to complete a test dig in order to identify any possible finds. The dwelling on this site fronts Cross Street and the area investigated was to the rear of it. The overall size of the site was small ie. less than 5 metres square. The site was in the area immediately west of a brick garage and shed to the rear of the dwelling. When the old garage base to the north was constructed the topsoil was removed and deposited on the area we were to investigate. A mud/clinker compacted path ran across part of the site and was of relatively recent construction. Day one; A trench 2.60 metres long and 0.60 metres wide was opened up roughly parallel to the garage wall on the east. Point A marking one end of the trench was 2.40 metres from the southern corner and 5.10 metres from the northern corner of the garage. Point B marking the other end of the trench was 4.00 metres from the southern corner and 3.30 from the northern corner of the garage. The trench was excavated to a depth of 40cm. 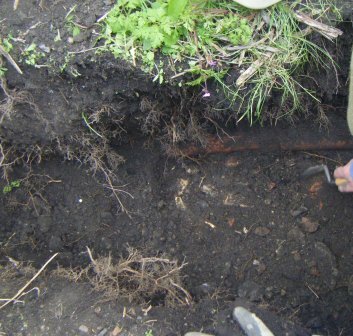 An incomplete line of five cay drainage pipes was found at a depth of 35cm. A few modern bricks were also present in the southern end of the trench. Day two; The trench was extended 30cm to the east as indicated on the sketch by the dotted line. The whole trench was excavated to a depth of 70cm. A further small area was opened up to the north as indicated. 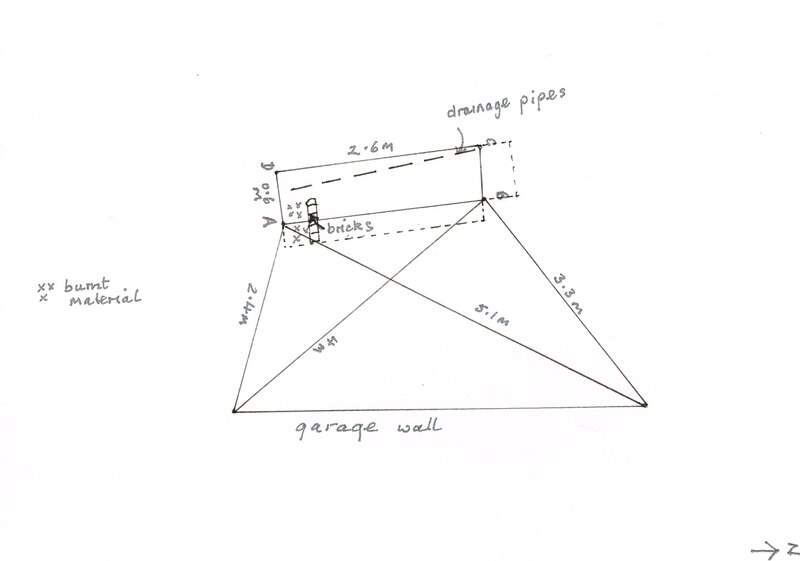 Five course of modern bricks were found towards the southern end of the trench between 40-70cm in depth, laid bond fashion, but not mortared, thus forming a loose wall running towards the garage. A concentration of burnt material was found between this loose wall and the southern end of the trench. The finds included a variety of broken pottery, mainly of late 19th/early 20th century origin, including an intact old Bovril bottle. Part of the trench uncovered the sight of numerous bonfires. The large quantity of topsoil meant the trench did not go deeply into the subsoil. There were no other significant finds, for example, no medieval shards of pottery. 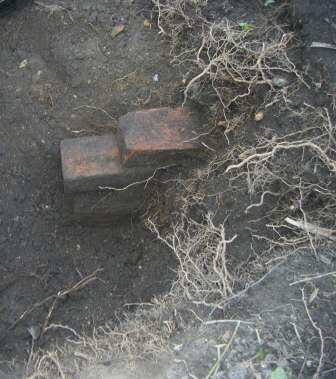 The remnants of a Victorian drainage system meant that the soil had been extensively disturbed.